Life was tough for anyone living in Santa Rosa in the week after the 1906 earthquake. Electrical lighting was out for six days, and gas remained shutoff for more than a week beyond that. Many pitched tents on their lawn and slept outside while some camped in lodge halls or moved in with others who lived in towns less shaken. Pity also the friends and families outside of Santa Rosa. In that first week they heard that the town was completely wiped out with thousands possibly dead, and the pitiful few survivors were living like animals in the wilds. No wonder that the Democrat-Republican newspaper noted that "the amount of mail matter that is being received here is immense" and "hundreds of belated telegrams are being received here daily for Santa Rosans and Sonoma County people." The rumors of Santa Rosa's demise were greatly exaggerated, of course, and the worst of the misinformation appears to have originated in an outrageously false item published by the cobbled together San Francisco "Call-Chronicle-Examiner" the day after the catastrophe. Here was the first reference to "10,000 homeless men, women, and children huddled together... [in the] hills." Those survivors were huddled in the Rincoon [sic] hills, specifically, and that was only the beginning of the bad news: Sebastopol, Healdsburg, Geyserville, Cloverdale, Hopland and Ukiah were also destroyed, along with Sonoma, Glen Ellen, and the rest of the Sonoma Valley. Nearly everything between Marin and somewhere near the Oregon border was now flattened, if you believed that article, and sadly, many other newspaper editors around the nation did. It took a couple of days for the national media hysteria to wane; on April 20, a Washington Post headline warned, "Loss of life in Santa Rosa may reach to thousands," but the paper shifted down gear the next day with the more accurate, "40 die at Santa Rosa - First reports of the disaster greatly exaggerated." Still, an appetite for horror remained. A few days later, several papers also picked up the dramatic first-hand account of C. O. (sometimes, C. A.) Duffy, who escaped death in the Saint Rose Hotel by throwing himself on the floor of his room next to a sturdy mahogany dresser just as the building collapsed. The Associated Press wire story of April 22nd claimed he also said, "When I registered at the Santa Rosa Tuesday night there were ninety-eight people in this hotel altogether. When the crash came during the awful earthquake none could escape." Not explained was how a hotel guest happened to know that there were precisely 98 people there on that morning, but it certainly made it a more tragic tale, and nudged the death toll higher. But the award for Best Creative Writing goes to an AP story datelined April 26, more than a week after the quake: "Cut off by the disaster from communication with the outside world, Santa Rosa knew nothing of the destruction of San Francisco until the arrival from there of a trainload of nearly 1,000 refugees, begging for help..." It was utter bull; the edition of the Santa Rosa Republican printed the very afternoon of the quake had details about the situation in San Francisco, noting that the news came on the morning train (sans refugees). The author of this melodramatic scenario probably went on to a swell career writing Hollywood screenplays. Awards for audacity and tastelessness must also be given to the advertisement shown at right, which appeared in the June 16, 1906 Oakland Tribune, and used the Santa Rosa tragedy to promote both sobriety and peddle soda pop: "If you are looking for miracles, try one of those Fruit Punches at Lehnhardt's." ...What was not destroyed by the earthquake has been swept by fire. Until the flames leaped into the heavens there was hope of saving the residence district. It was soon apparent that any such idea, that might have been entertained, was to be abandoned. This was appreciated by the citizens and they prepared to desert their homes. Not even their household goods were taken. They made for the fields and hills, to watch the destruction of one of the most beautiful cities of the West. The water system of the municipality was destroyed by the earthquake. Fire fighting was not to be thought of. The city was at the mercy of the elements and crumbled and cracked as the gentle west breeze from the great Pacific blew from the hill to fan the flames to undestroyed localities. Thus the citizens watched from the Rincoon [sic] hills their homes erased. ...On the north conditions are fully as shocking as here. There is no communication by wire or railroad between here and Healdsburg...Many have arrived, however, on horseback and in wagons. ...To the southeast of here, Sonoma, Glen Ellen, and a dozen other small towns throughout the Sonoma Valley, are all reported in ruins. The country far and wide, from the meager reports received by horsemen, must be in ruin. How many are dead and suffering in these outlying districts cannot be ascertained at the writing. It seems that to say, "Some are alive," is the easiest and most accurate report to send to the outside world. "There is not a brick building left standing in Santa Rosa, and the entire devastated territory has been burned over. "Dead bodies were being taken out of the debris of the wrecked houses on all sides. It is estimated that the death roll will foot up from 200 to 500." WASHINGTON POST (April 19) - It is certain that Santa Rosa, a pretty town of about 10,000 inhabitants, is as completely destroyed as San Francisco. The part spared by the earthquake was swept by fire, and the inhabitants are shelterless in the hills. Rumors place the loss of life at 500, and it may reach into the thousands. OAKLAND TRIBUNE (April 22) - Bankers and millionaires are going about with only the few dollars they happened to have in their pockets when the catastrophe came and are little better off than the laborers who are digging through the debris. Money was of practically no value here, for there is no place to spend it, and this phase of the situation presents its own remedy. ASSOCIATED PRESS (April 26) - The entire business section of the town was destroyed and many residents went down. 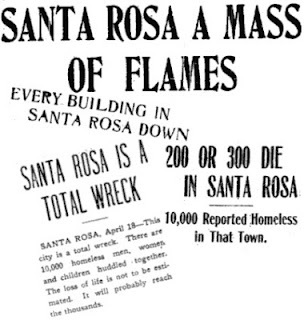 Cut off by the disaster from communication with the outside world, Santa Rosa knew nothing of the destruction of San Francisco until the arrival from there of a trainload of nearly 1000 refugees, begging for help that could be given them. But near-by towns came to the rescue and after a period of starvation and suffering aid was received.